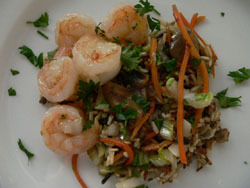 The rice I use in this Vegetable Rice Recipe is a long grain brown and wild rice blend. I try to eat whole-grain rice rather than refined grains to get the nutritional value. Brown rice is a whole natural grain that has a mild nutty flavor, is chewier and more nutritious. Also try the blend with long black wild rice, it is a sweet nutty tasting seed. Lundbergs brand has a number of different blends that I like. Served this dish with white fish or shrimp. Leftovers can go with the grilled chicken breast the next night. If you are looking for vegetarian recipes, add some tofu or beans for your protein to make a complete meal. In a medium pot combine rice, chicken broth. Bring to boil, stir and cover pot. Reduce heat to simmer, cook for 45-50 minutes with out picking up the cover. Liquid should be completely gone when rice is tender. While rice is cooking prepare your vegetables and oil. In large skillet add pressed garlic and oil, let sit for 20 to 30 minutes with out cooking. Heat to medium-high, add all the vegetables except the roasted peppers and garlic. Saute 10 minutes (you may have to add a little more oil or butter if too dry) Add roasted peppers and garlic, gently stir in as the roasted vegetables are very tender and if over stirred will turn to mush. Serve vegetable over rice with your favorite choice of entree like fish, shrimp or chicken. One cup of raw rice makes 2 cups cooked plus the vegetables will give you a finish dish of about 5-6 cups. If you find you have too much, you can freeze the leftovers and just reheat in a skillet with a little butter.